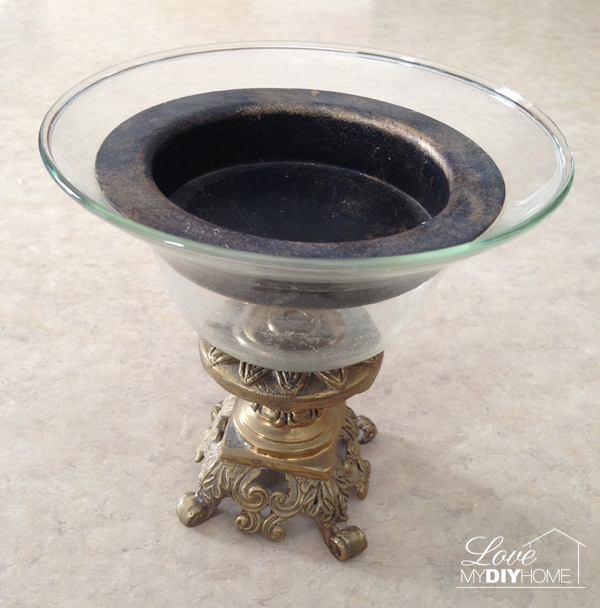 From Trash to Treasure – Update old brass decor, don’t toss it! I told you about the cast off treasures I got from a friend in my first From Trash to Treasure post here. Here are brass pieces that NO ONE wants. After painting the brass finishes with my dark walnut satin Rust-Oleum spraypaint, I decided to mix and match the parts to make new pieces. Brass decor isn’t very popular these days, but there is no reason we can’t update. I put the painted brass on my kitchen island to dry in the warm kitchen (negative 10 degrees in my garage where I painted it). Each time I passed by them, I thought about how they would look once I put them together. I don’t wait very patiently for my projects to dry. EVER. 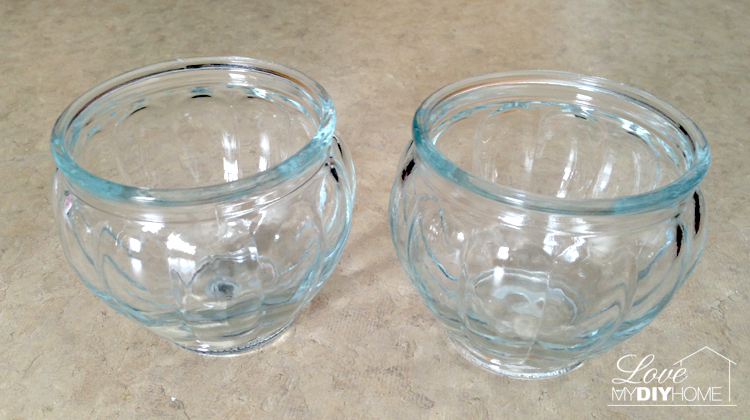 These glass bowls aren’t anything special. I’m guessing they were the top part of something since there are circles of what looks like glue from a glue gun. I thought about putting these atop some old brass candlesticks I’ve had forever. Ahh, but I came up with something much better! This is the third “before” picture. 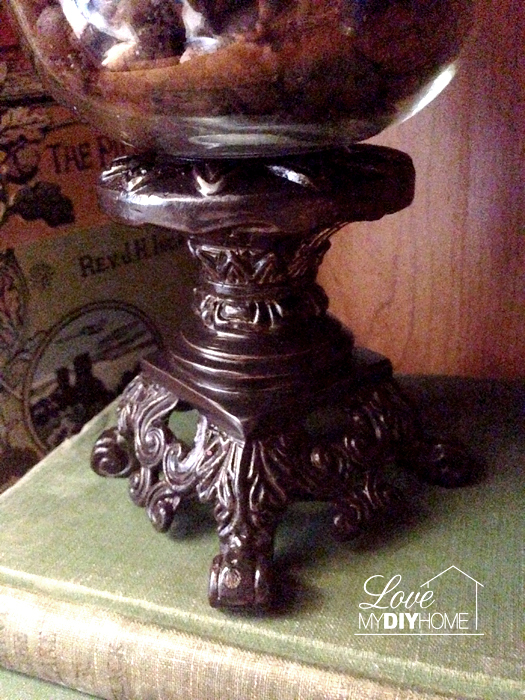 This looks like an old Home Interiors candle holder. I started out by painting it with my dark walnut satin Rust-Oleum spray paint thinking I would just put it back together. First I had trouble with the paint not covering it all after three attempts, then on my fourth attempt the paint dripped because I was too heavy handed and it pooled on the rim in a ripple effect. I wiped most of it off with paper towel, planning to repaint it after it dried. You’d think I’d never painted before. Sheesh. I have no patience. But then I sanded it after it was dry to make sure it was smooth enough to paint and liked how it looked. I sanded the rest of it a bit to give it a distressed look. Ha! Another “mistake turned trendy” paint job. I let all the painted brass pieces dry for several hours and then started to put them together – then BINGO! I mixed and matched the pieces. Here is the first one – voilá! 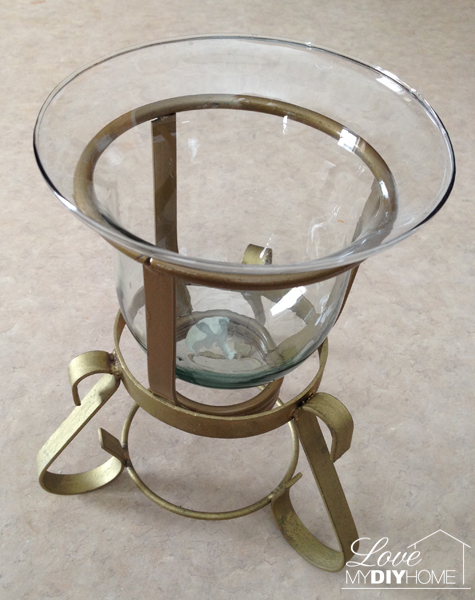 Brass candy dish turned old world candle holder. 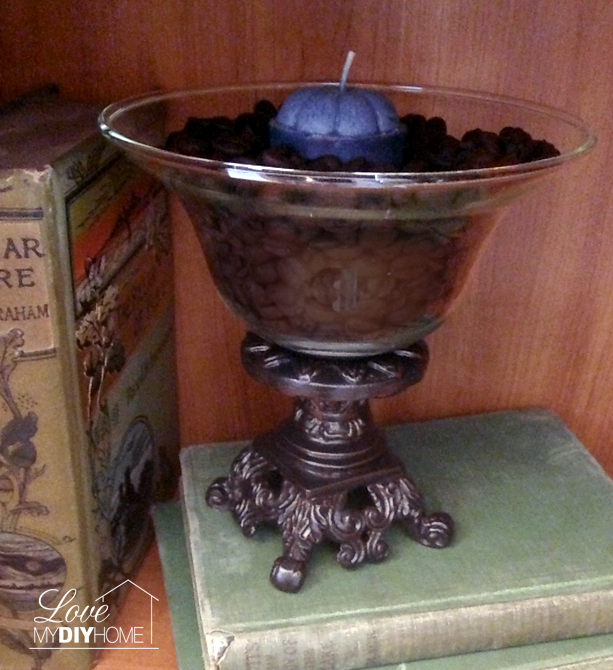 The votive candle is nestled in coffee beans. Someone posted on Pinterest that we ought not light the candle because the beans are flammable. So just look, don’t light! This looks great in my livingroom bookshelf next to my old books. Here’s my mix and match. Isn’t that just the COOLEST? It reminds me of a ship captain’s lantern. See where I sanded it a bit to bring out the brass? Perfect isn’t always perfect. Sometimes a little imperfection is what makes it perfect. KWIM? 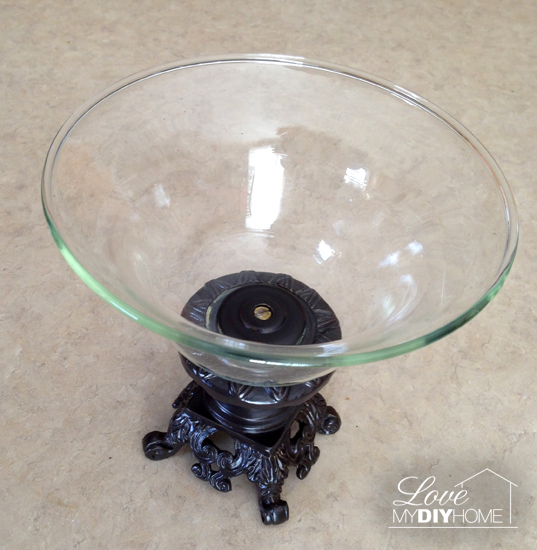 The “nothing special” glass bowl turned base when I turned it upside down and tried the candle holder on top – it snapped right on as if it was made for it. Oh yeah. Another accidental art project. During the holidays I plan to put something shiny and glitzy inside the base. In the Spring it could be flowers, Fall? Perhaps candy corn, acorns or pinecones. For Christmas it could hold red miniature bulbs. Drab to fab I’m telling ya, drab to fab! 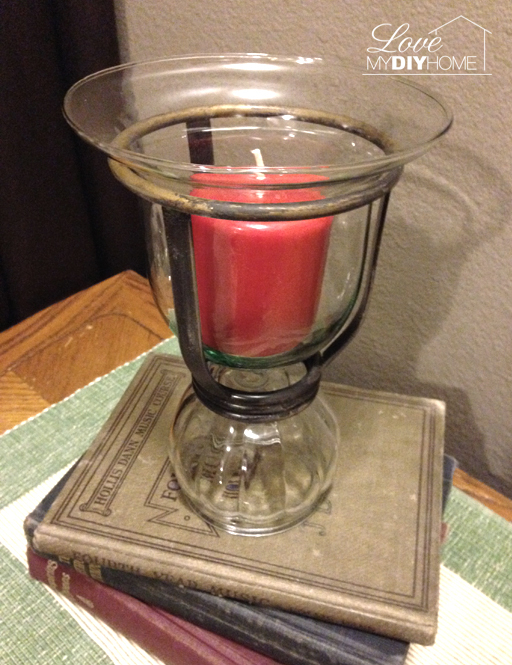 Here’s a similar redo in case you didn’t catch it – I took a hurricane glass from the same giveaway box and put it on one of my wood candleholders to make a hurricane lamp. Honestly, there’s nothing like a “boring throw me away piece of deco turned fabulous can’t believe I own it and can look at it every day because I made it” moment! I still have a wine bottle box hanging from a thick rope that I’ll redo next using Mod Podge and scrapbook paper – stay tuned! 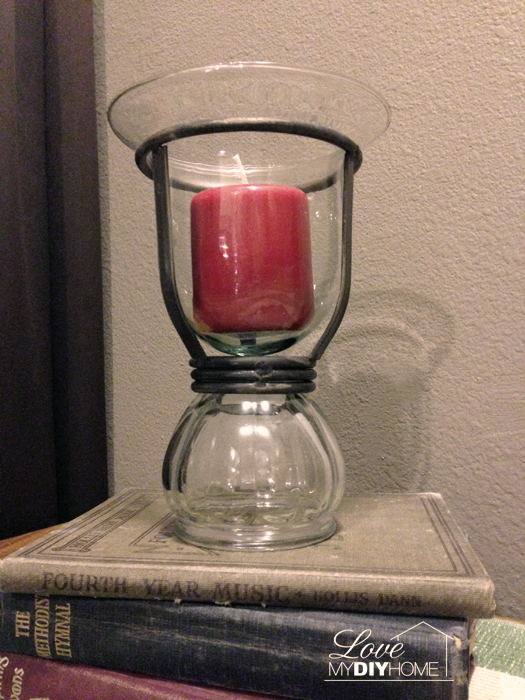 For good measure, I took the left over pieces and put them together for a simple candleholder. Simple is still good, no? The only piece I have left is one of the little glass bowls. I’ll probably just perch that on a brass candle holder after I paint it. Taking something that is considered trash and making it into a treasure is VERY satisfying! I spent years, I’m not exaggerating, years looking at home decor that made me drool, knowing I couldn’t in good conscience spend our money on it just so I could have something pretty in my house. 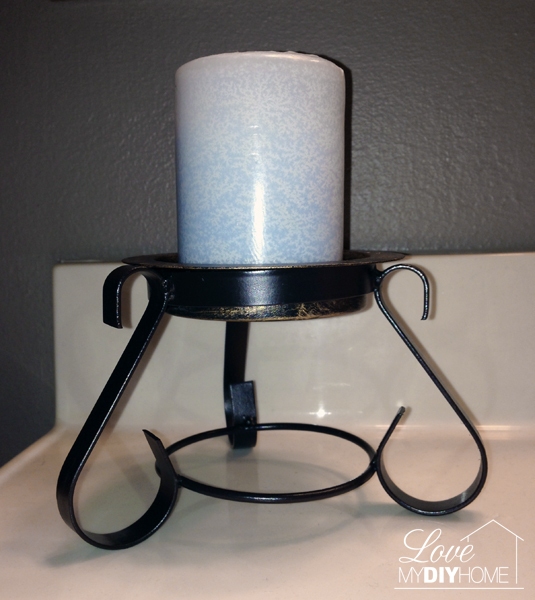 School supplies, dental appointments and bean burritos were priorities, not candle holders! Turning trash into treasure makes me much happier than just going out and buying whatever I want (though I wouldn’t mind doing THAT occasionally). To look at something that was destined for the landfill knowing I upcycled it into a treasure turns into a happy dance. Do you just go out and buy whatever you want? 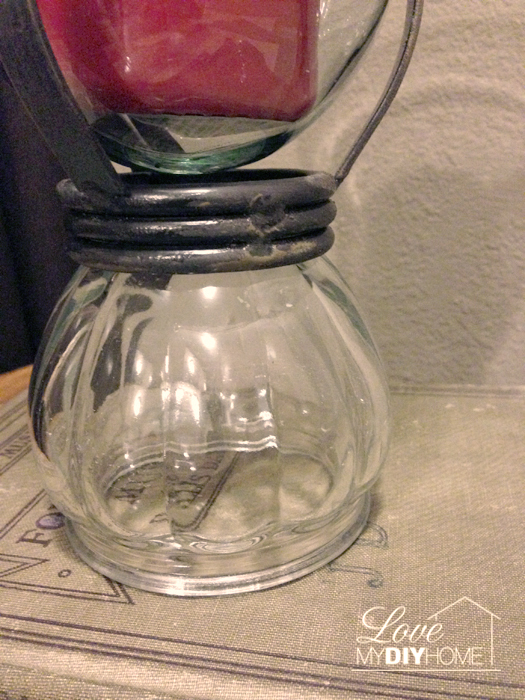 Next time I upcycle a piece of decor, I’ll be trying a chalk type paint – either homemade or a brand. I like to compare. Have you tried chalky paint yet? Here are recipes if you’re adventurous (or cheap!) Just click on the pic for the recipes and I’ll email a PDF to you. 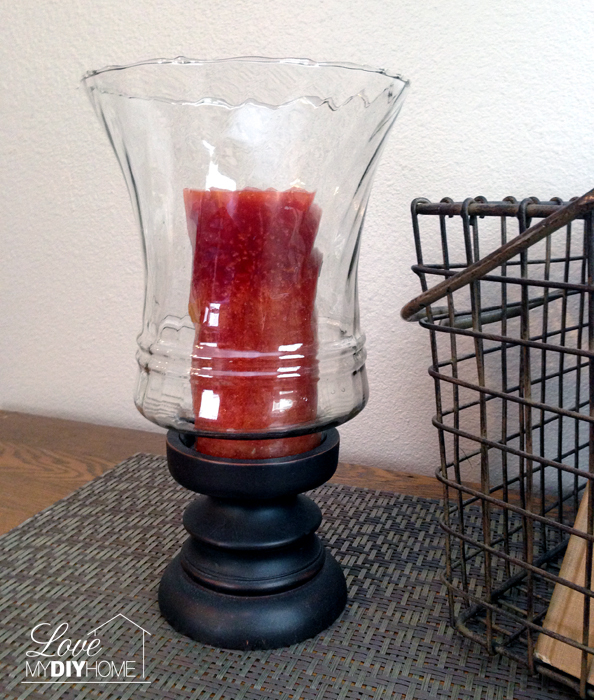 Ningxia Red Bottle Upcycle 2 Guest Master Bedroom – Before and After How to Upcycle an Antique Door – Part 2 DIY Silver Painted Decorative Vase Ningxia Red Bottle Upcycle Old Tissue Box Revived – Spray Paint Season is Here! They are all fabulous looking, Val! Thanks, Christy. 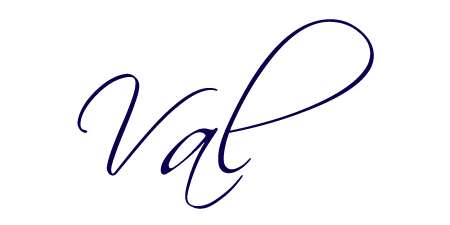 I look forward to posting on your Thinking Spring link up. Spring has got to come, right? Waiting patiently here in Wisconsin! Love that you are 'upcycling' trash into some beauties! I couldn't help notice the titles of your old books. I'm sure my parents have a similar 'Methodist Hymnal' too. Visiting via SITS Spring Fling. Barb, thanks for stopping by. I checked out your blog – I liked the stamp that said, “Better than Email.” I need to get back to my stamps! NOTHIBG is more satisfying than salvaging an item and turning into something beautiful! I've alway said-paint makes such a difference!! You definitely proved me right, Val! Great transformations! Thank you for the inspiration! Yes, paint is the bomb! It turns even the boring-est pieces into one-of-a-kind designer decor. Love love love updating things people just throw away! Love that new finished nice and suttle compared to the brass. This would be really amazing to implement on all those dated brass light fixtures. Great idea! Fortunately we don’t have any more brass light fixtures – in this house we did all new oil rubbed bronze. Spray paint can change just about anything! Thanks! I don’t know about getting any more patience – I just have such a hard time waiting till things dry! The end result is such fun I can’t wait to get there!